As of January 29th, just on the shores around the North Sea, sperm whales were found stranded in the shallow area that is not meant for marine wildlife. However, the details of the animals’ necropsy that was released shows a very gruesome truth as to how the whales dyed to begin with. Scientists were very concerned and deeply disturbed as to what they found inside the unfortunate whales. The press release that was given from Wadden Sea National Park located in Schleswig-Holstein, shows that many of the stranded whales stomachs were actually filled to the brim with plastic debris, which includes a 70 cm piece of plastic known to be apart of a car, a 13-meter-long fishing net, and a variety of other plastic debris that was found as well. Clearly, with this much debris in a whales stomach, there is no possible way for them to digest and get the nutrition necessary in order to survive. Having a full stomach and dying of starvation is one of the cruelest ways any marine animal could perish. 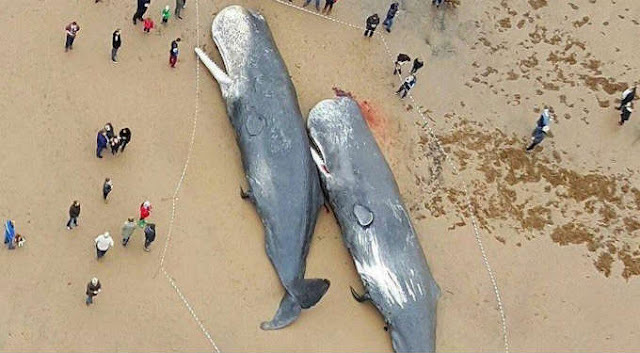 Some people suggest that this is due to the whales thinking that the plastic items were food, like squid since that is a whales go to staple. People on the other hand, however, believe that this is what happens when humanity continues to disregard marine life as well as the overabundance of plastic that is now circulating all over our oceans. It is very important thing to note that the young whales did not die due to the plastic in their stomachs. In fact, according to National Geographic, the whales had died due to heart failure. This was a consequence of them mistakenly swimming into the North Sea, most likely in search of squid, but then not being able to support the weight of their own body’s in such shallow water. As an unfortunate result, the whales internal organs had collapsed. Even that being the truth, humanity still needs to address this situation as a major warning sign about how much pollution we are pouring into our oceans. Do not dismiss their deaths as if it were meant to be, because it certainly wasn’t. These animals could have had longer lives without mistakenly consuming the extreme amounts of debris we keep giving our planet. End this horrible trend of pollution, help us turn the tides and clean our planet!